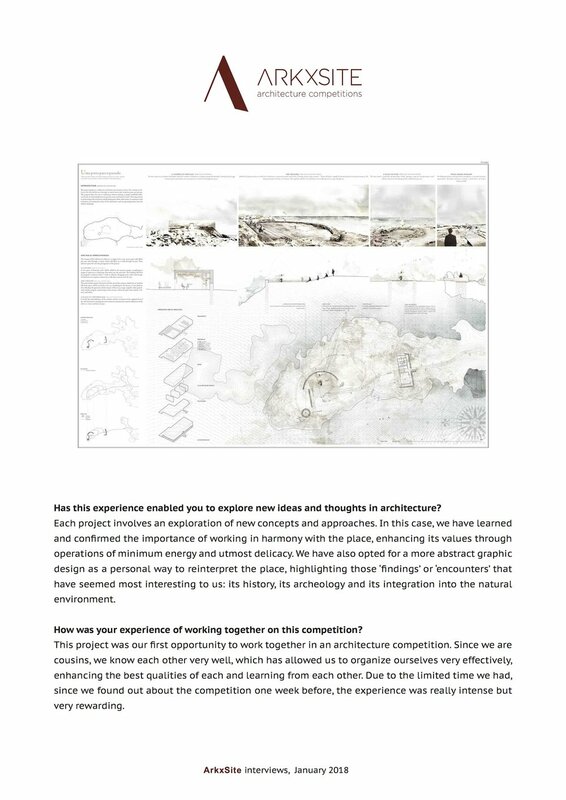 The results are composed of (3) teams of young professional architects and (7) teams of architecture students! 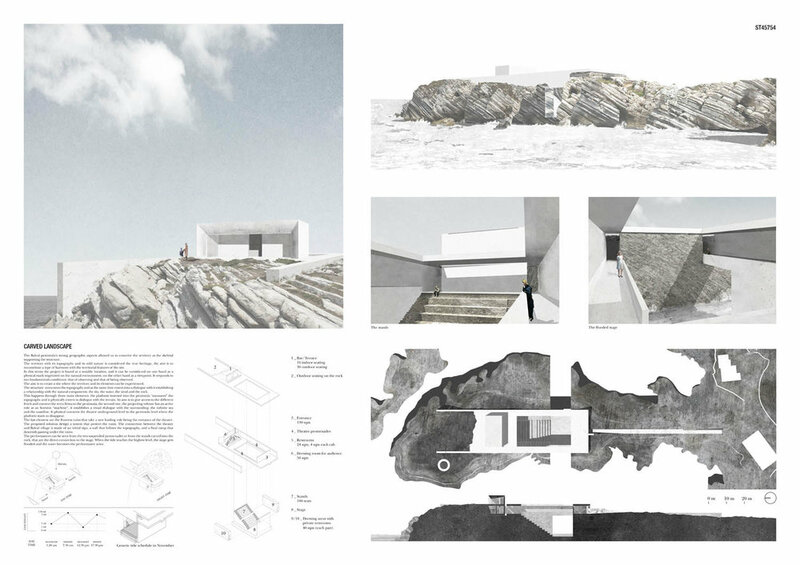 The search of an architecture that can coexist in perfect harmony with the landscape is rewarded. 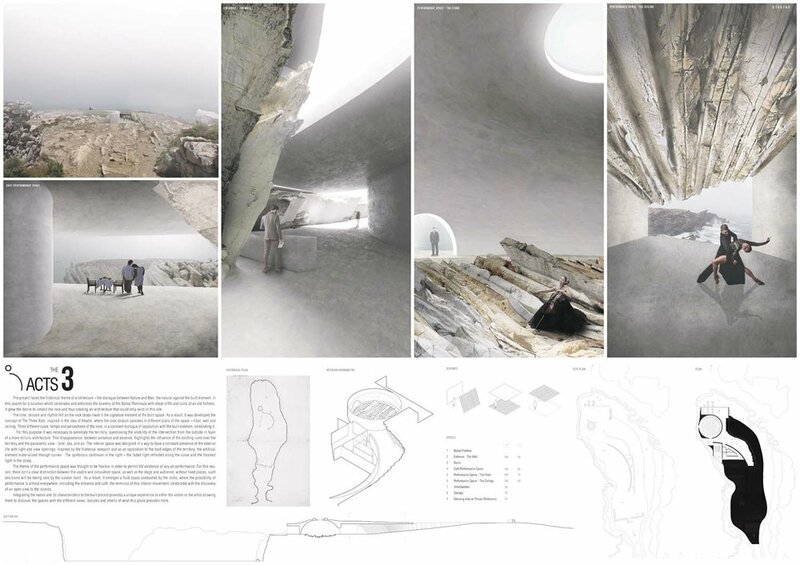 Special consideration is given to the use of noble materials belonging to the site and the minimum intervention that very carefully puts in order the requirements of the contest without disturbing the magnificent natural environment. 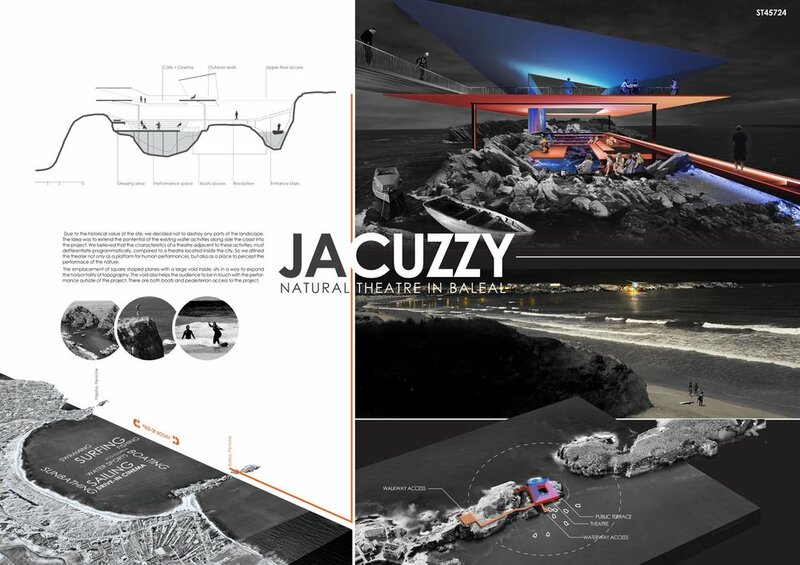 Through working closely with the existing landscape, and by attaching a simple structure on to an existing. 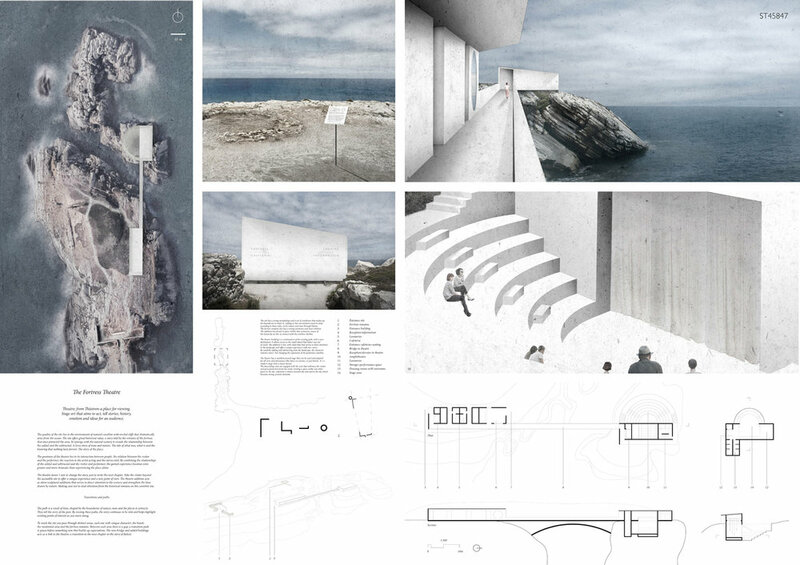 This project adapts to what is already there while enhancing and enriching the place further with something added in a very delicate way. 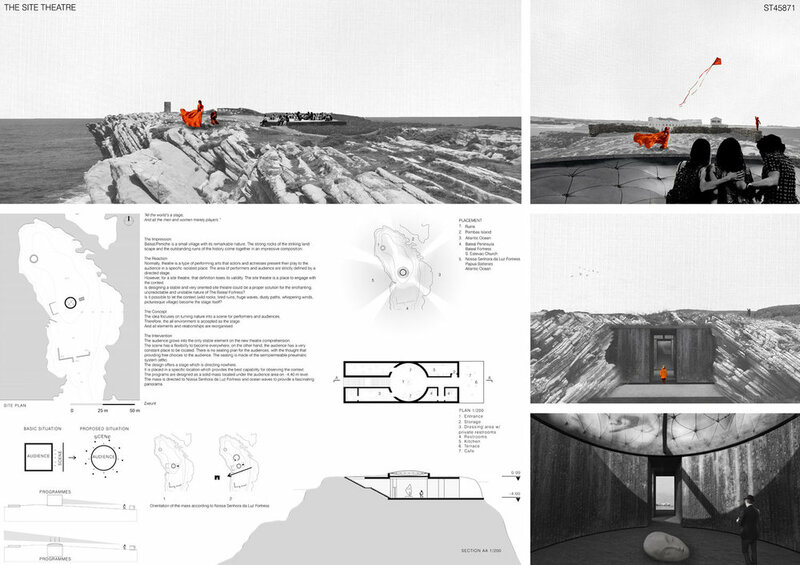 This project proposes a sensitive approach to the place. 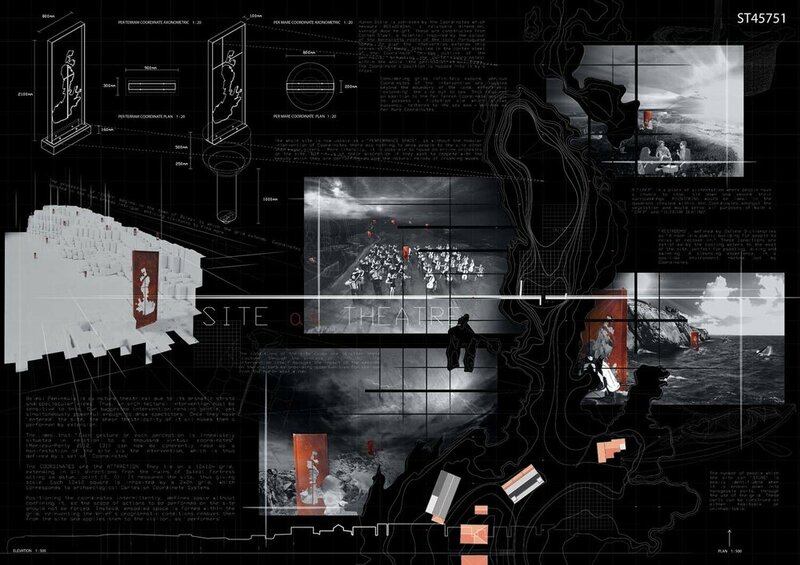 The old traces of forgotten constructions are activated and put in value in the present as a support for new activity, making the visitor feel the coexistence of different times without needing a mimetic reconstruction. 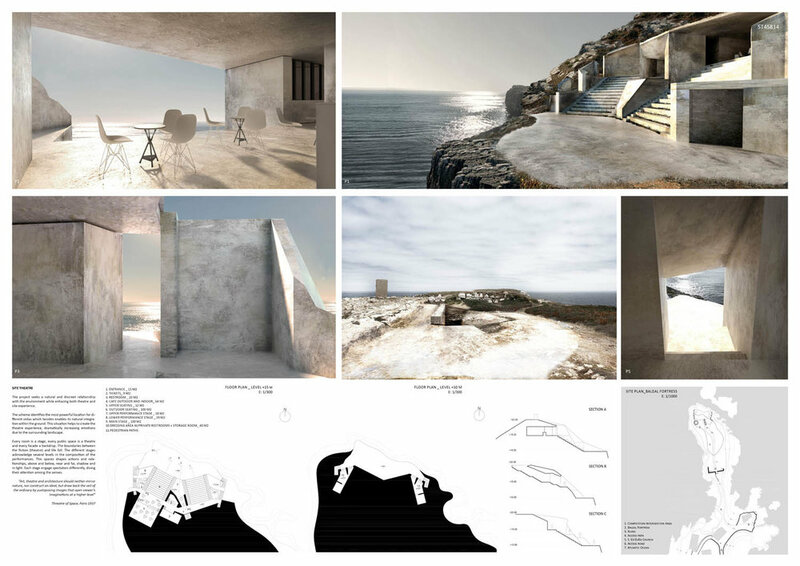 As the work awarded with the first prize, this 2nd prize is appreciated especially for the search of a very careful and limited intervention to preserve and highlight a magnificent natural environment, resorting exclusively to the use of noble materials and a very synthetic formal order, almost abstract. 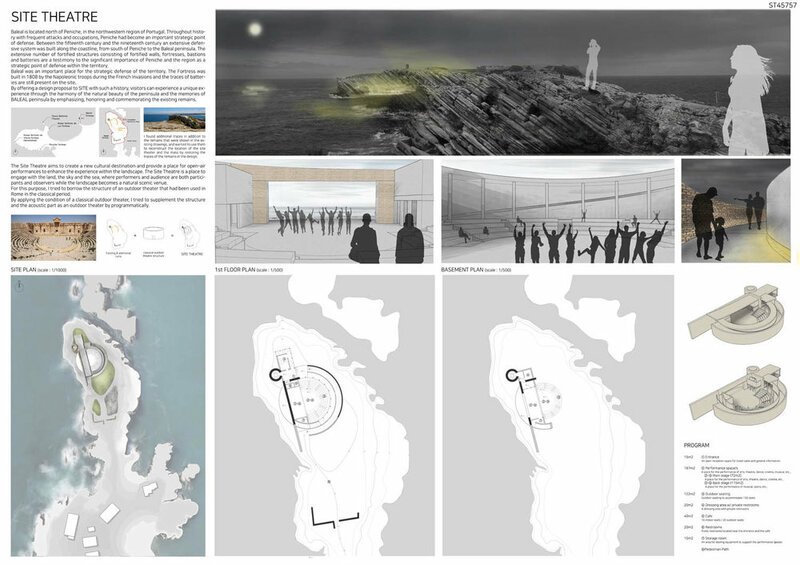 Formed by the wind and the landscape, almost hiding from the sea, this project creates a space for a theatre that is protected from the cold northern wind and will in the evening have the sunset as wonderful backdrop. 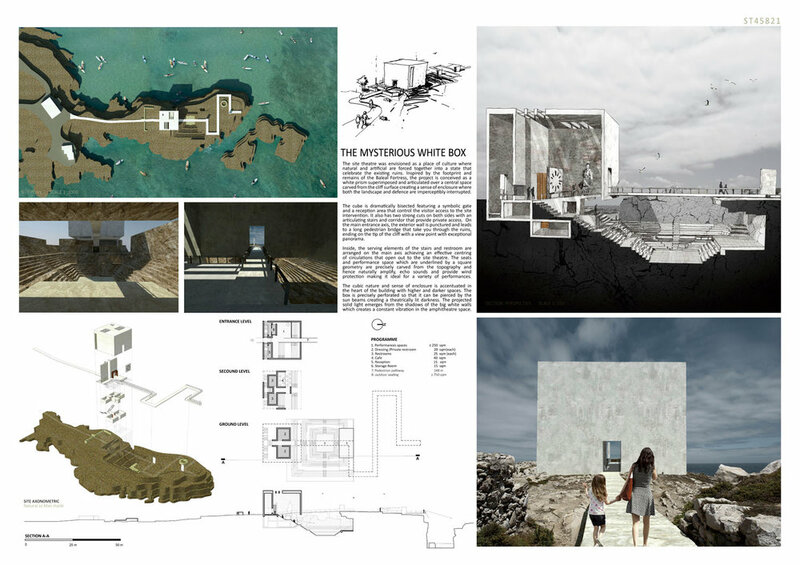 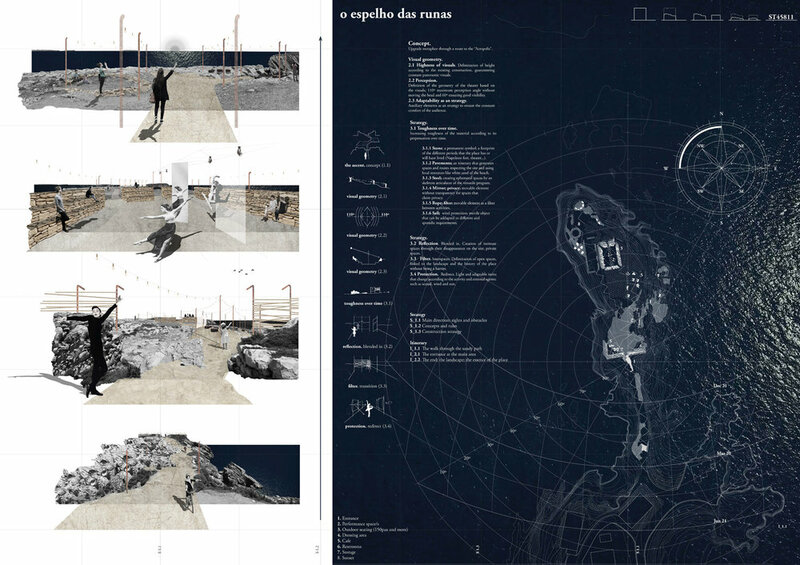 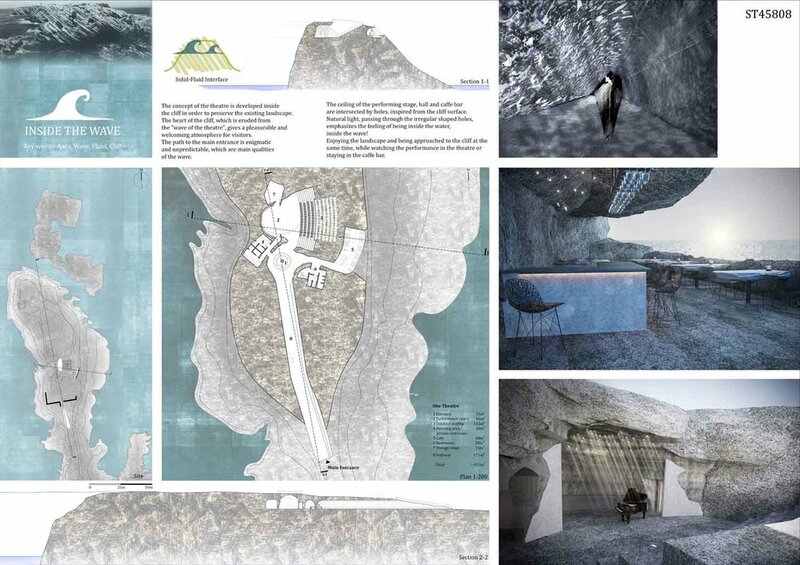 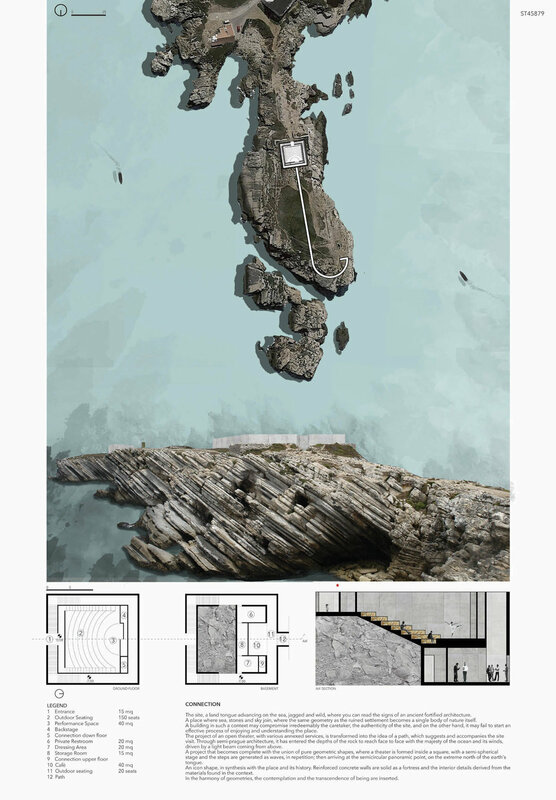 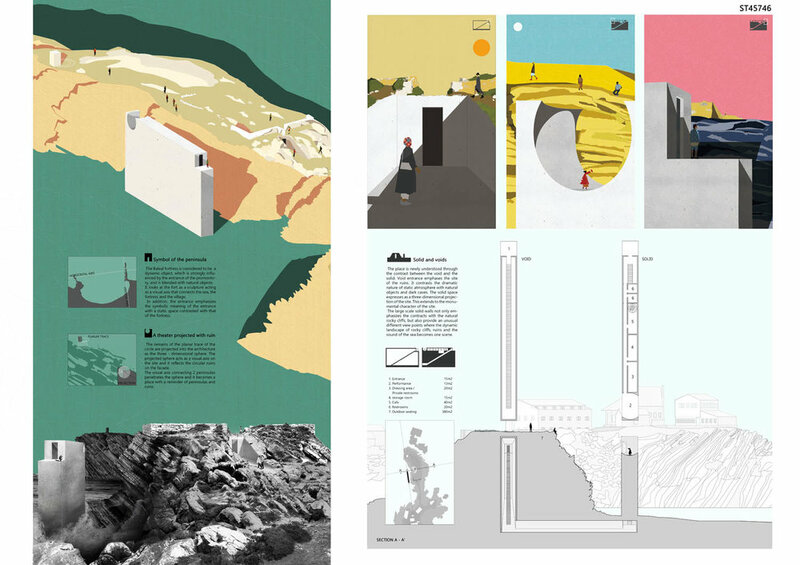 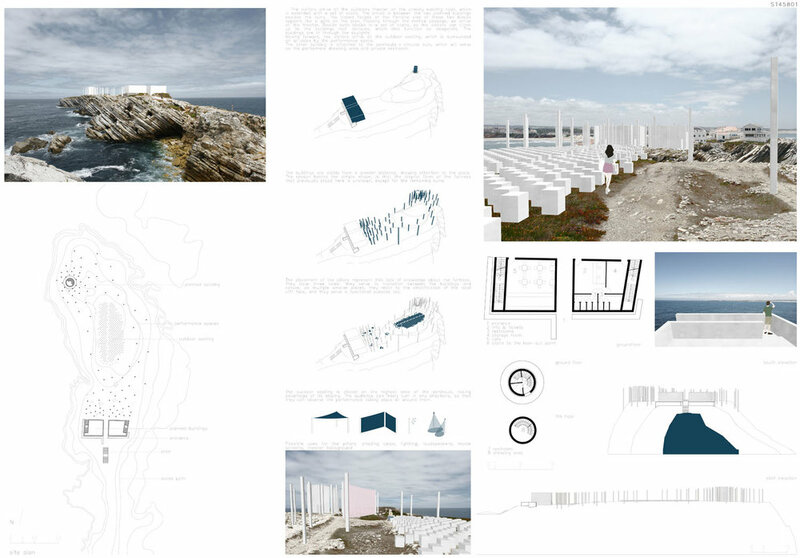 This interesting and radical proposal presents a journey to connect the visitor with the landscape that surrounds it: buried areas in the rock, a path from which to contemplate the ruin from a different point of view and finally the discovery of the horizon. 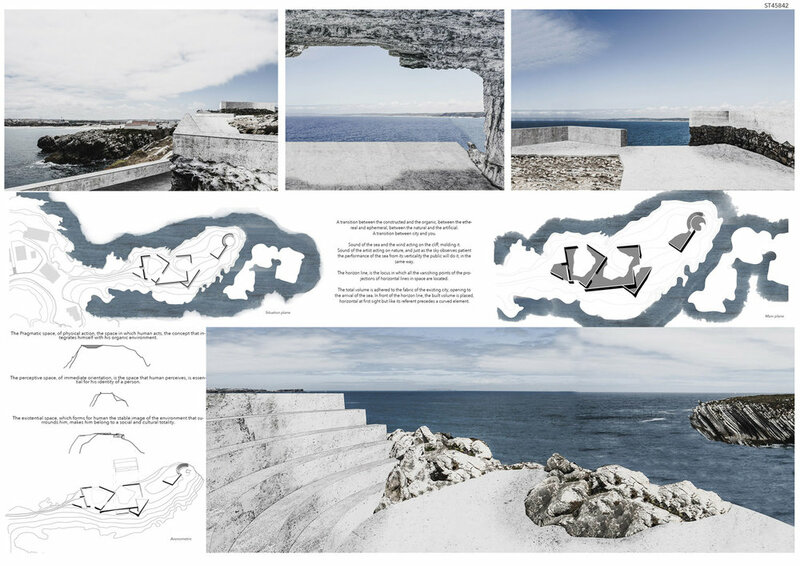 This work, like the other two winners, achieves with very limited but at the same time very dissident resources, to build a project that can dialogue with the magnificent natural landscape, obtaining photographic cuts to highlight it. 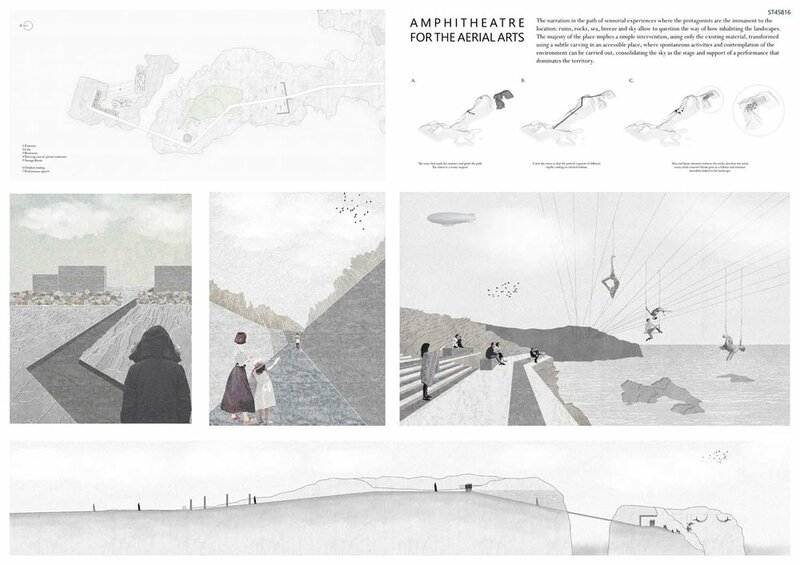 The use of sails that allude to the universe of the naval, although they serve to strongly mark the place chosen for the amphitheater, could affect the shows due to the wind noise. 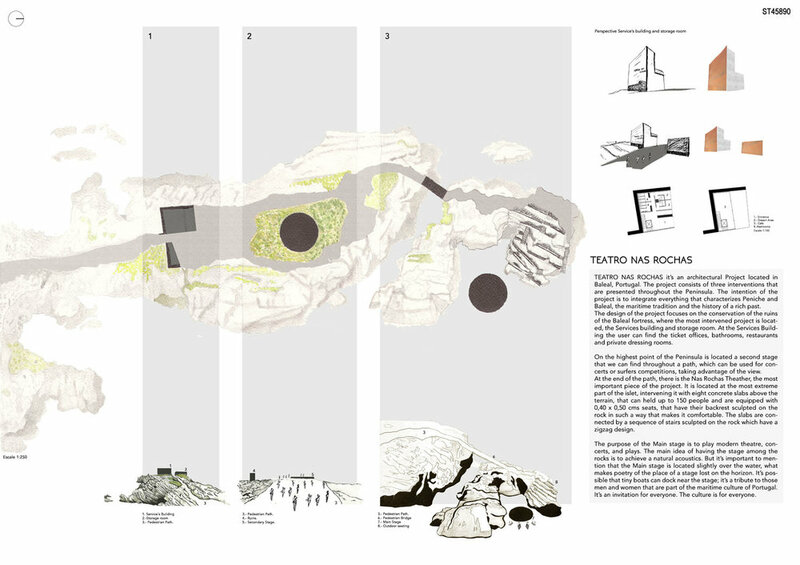 Nevertheless, without this last resource the intervention does not cease to be valid. 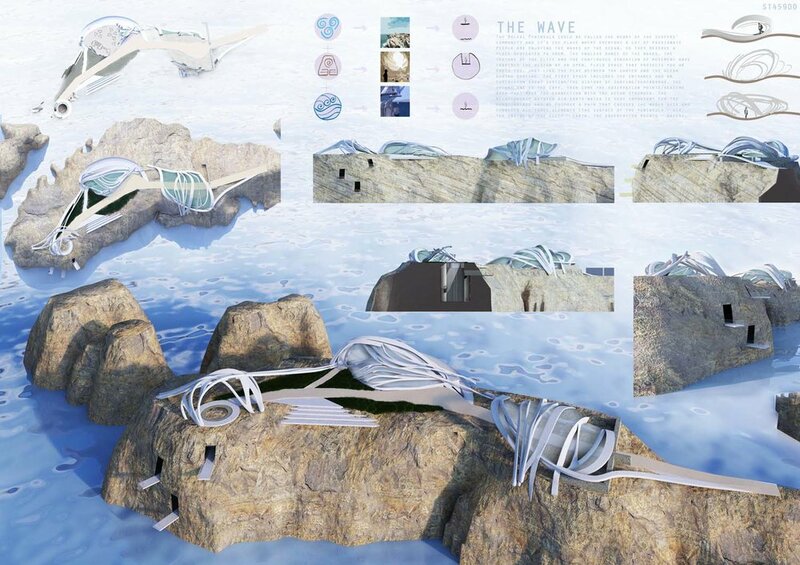 Awareness of the wind; using its advantages by creating a phenomena visible from the very far. 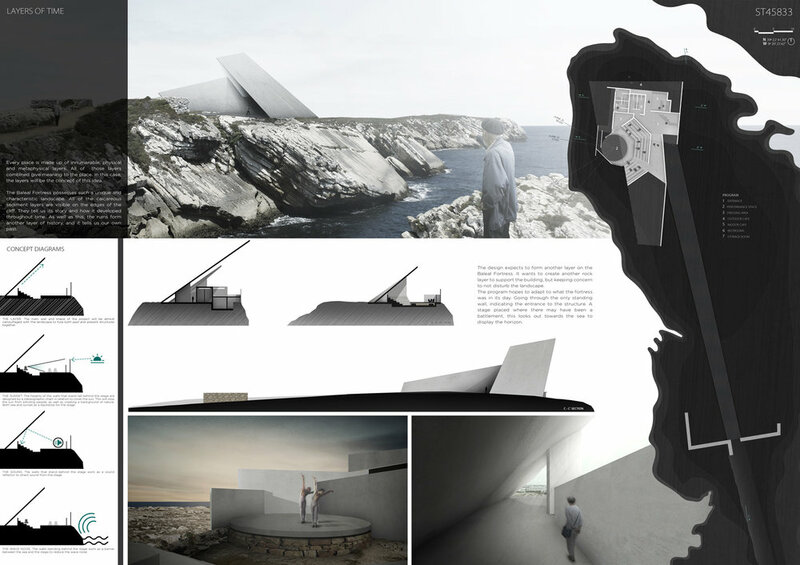 And at the same time protecting the theatre against it, through hiding in the landscape. 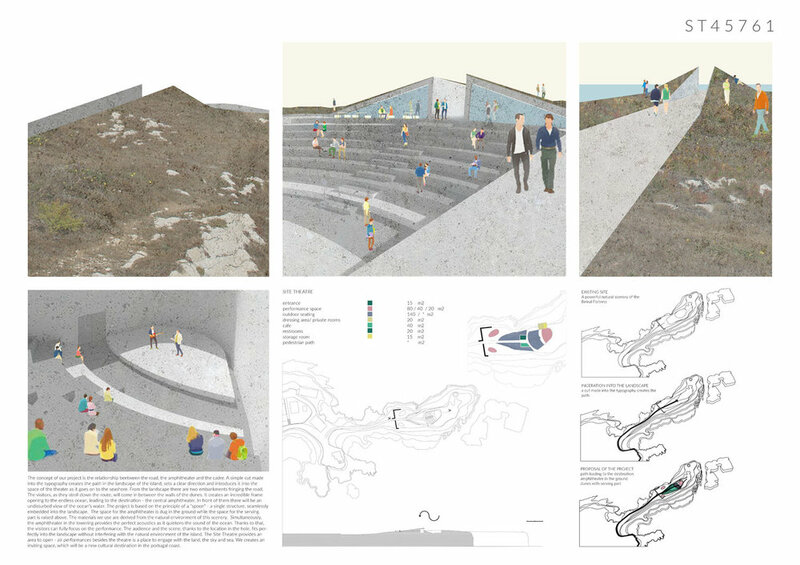 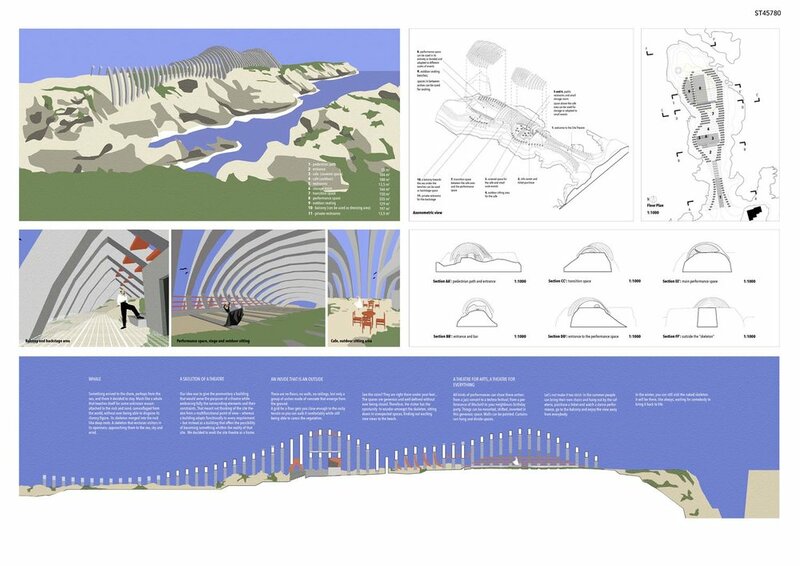 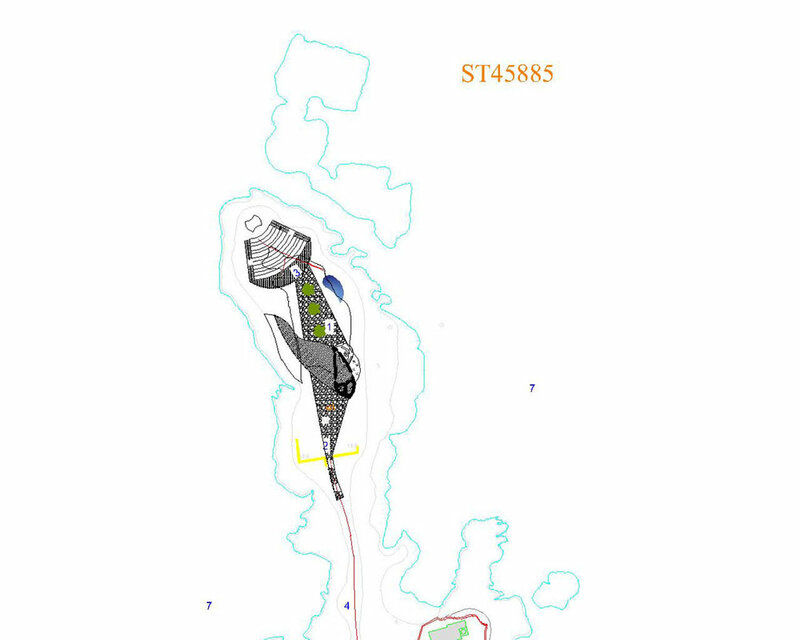 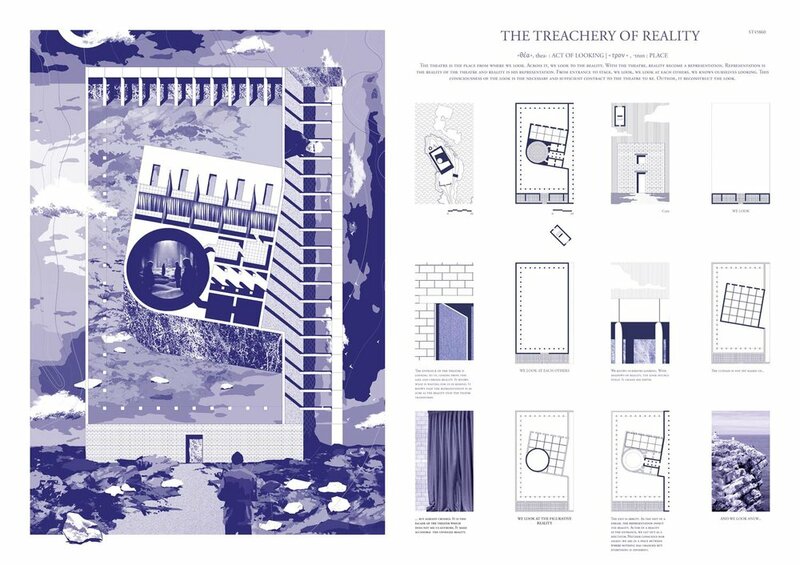 This project shows an understanding of the specifics of the site and how to make use of it. 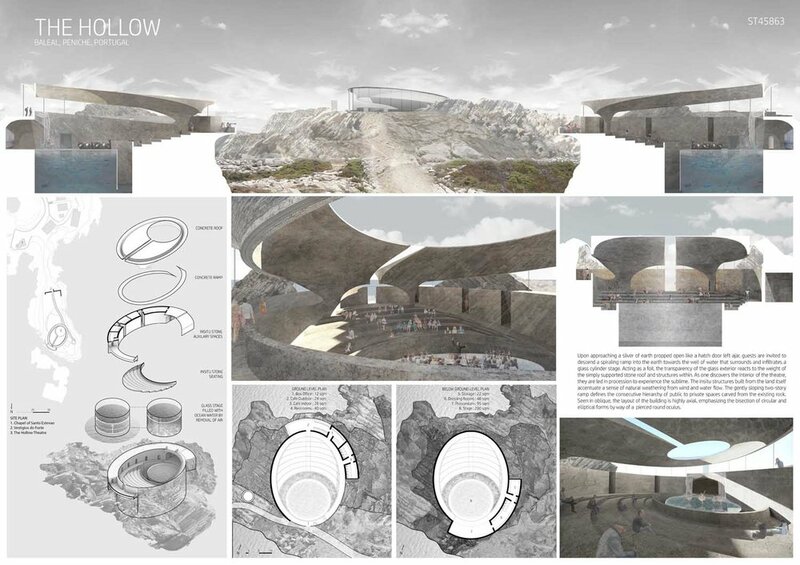 Highly poetic and evocative proposal that goes beyond the limits of the architectural discipline to form part of a wider world, linked to the changing experience of the site. 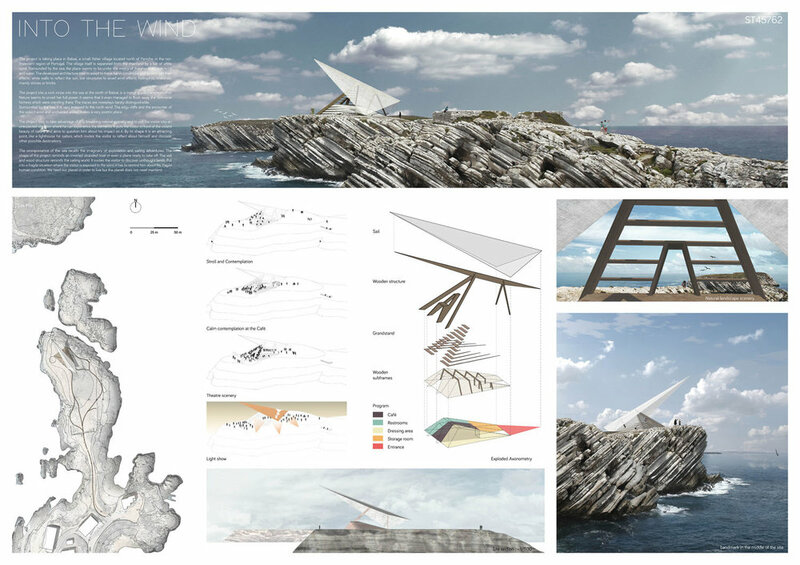 The fact of not building, but unfolding a sail, conveys the cozy feeling that the landscape is the true protagonist. 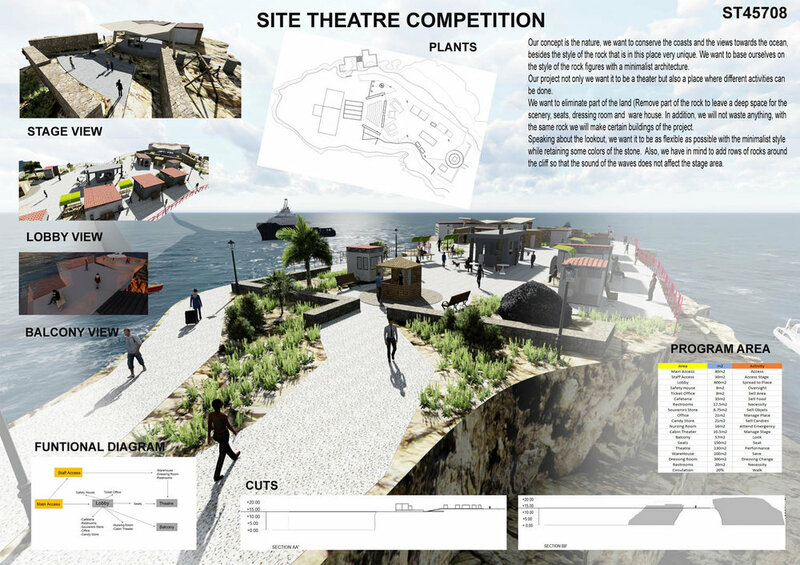 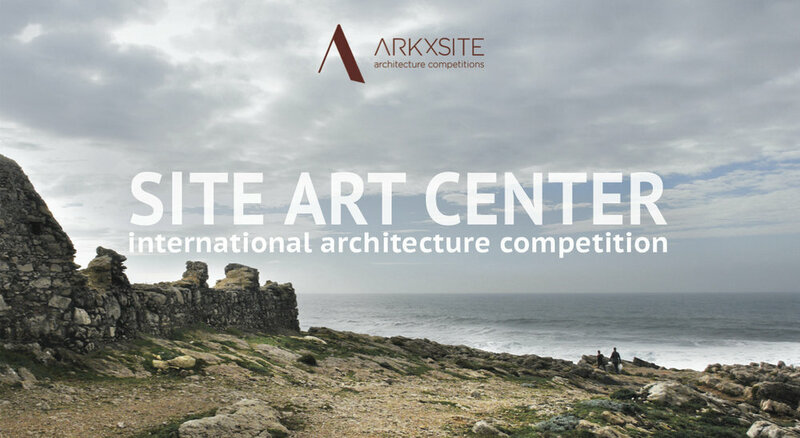 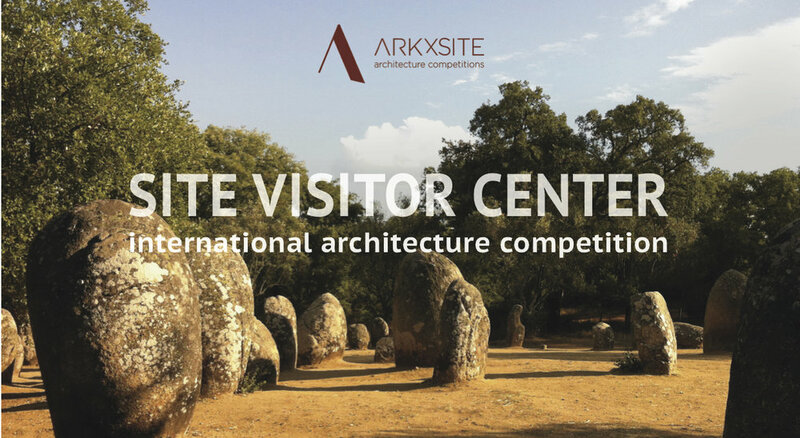 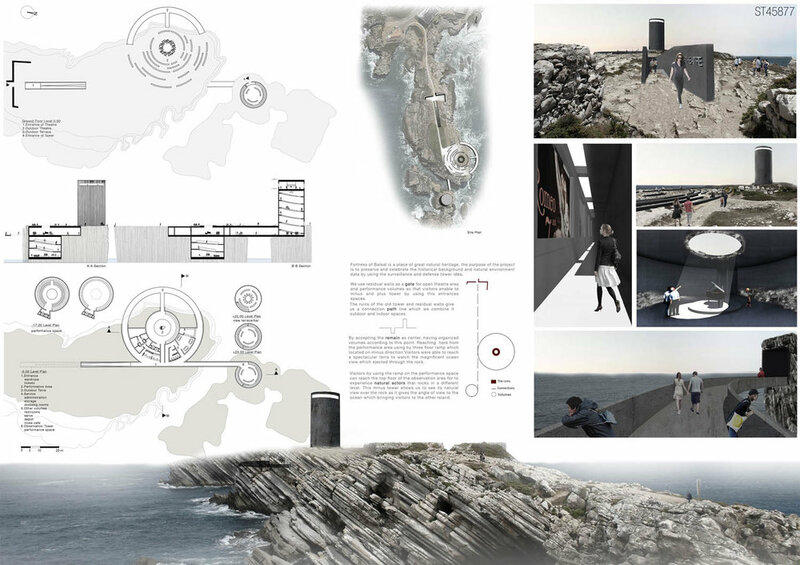 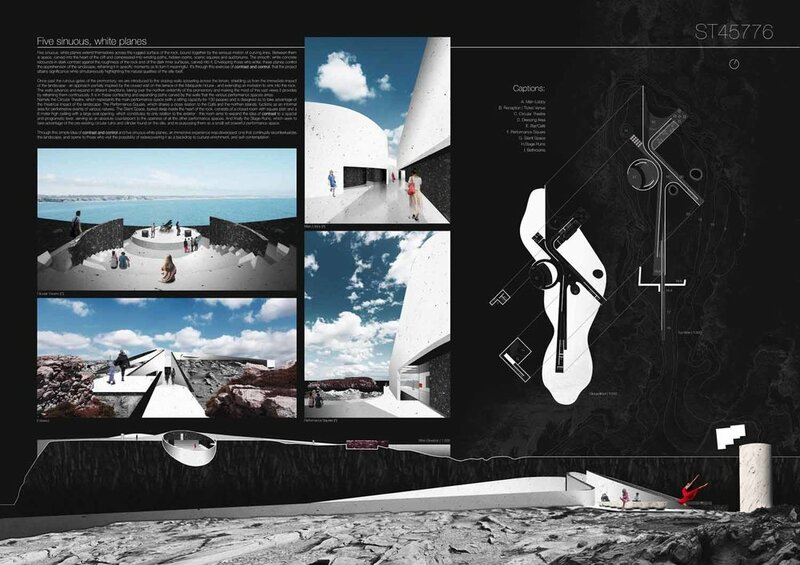 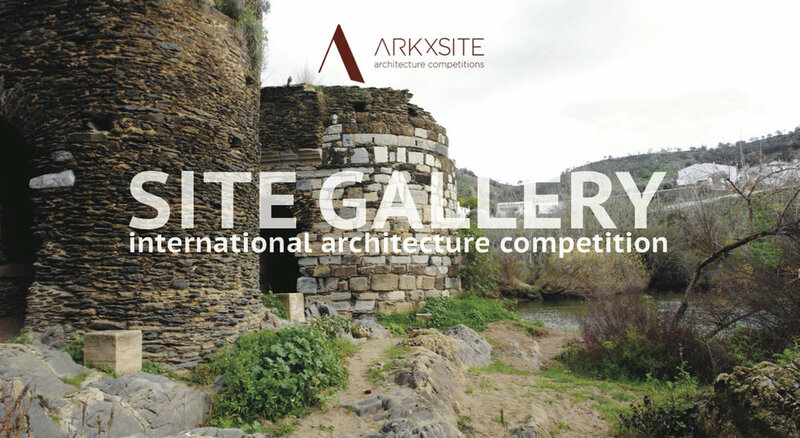 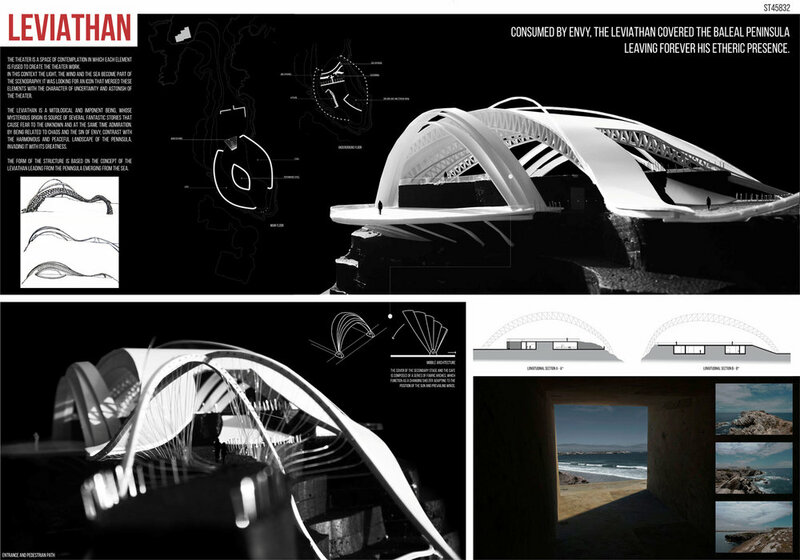 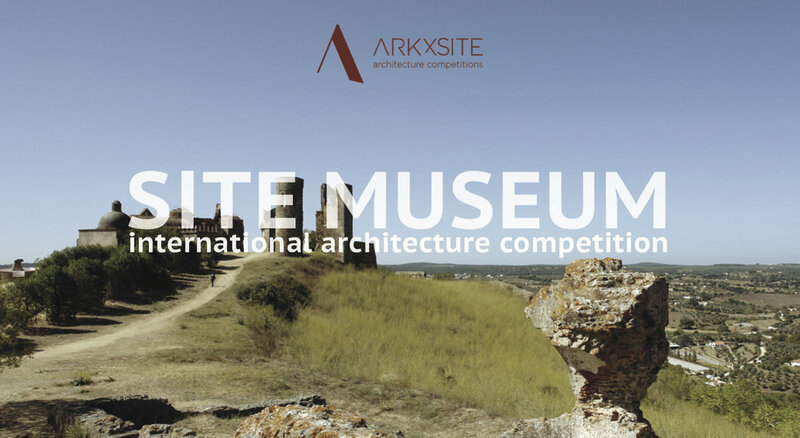 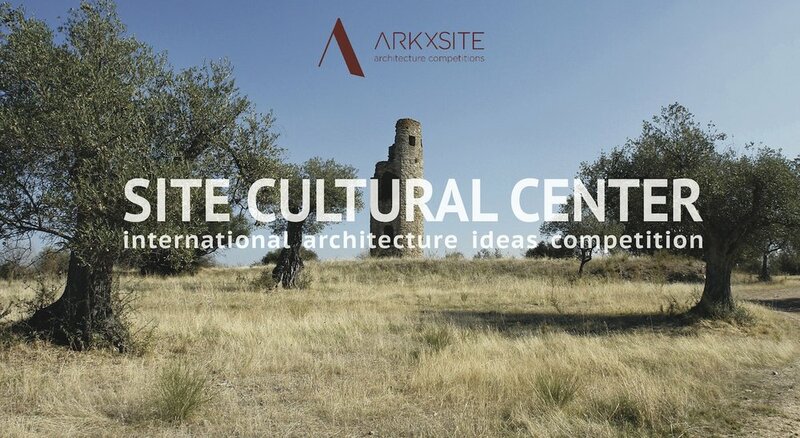 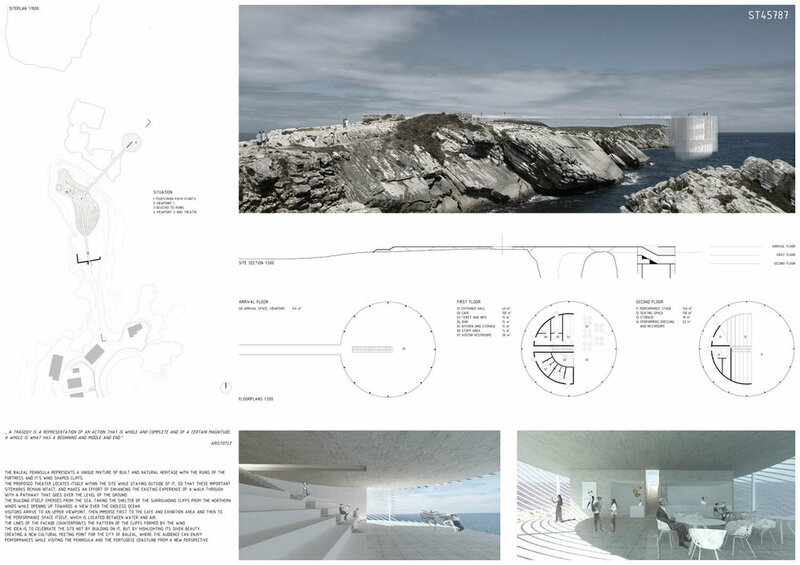 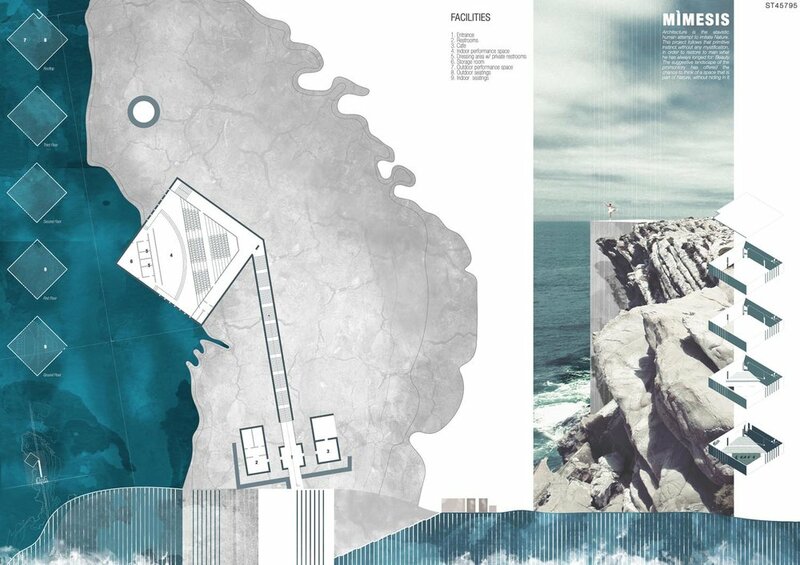 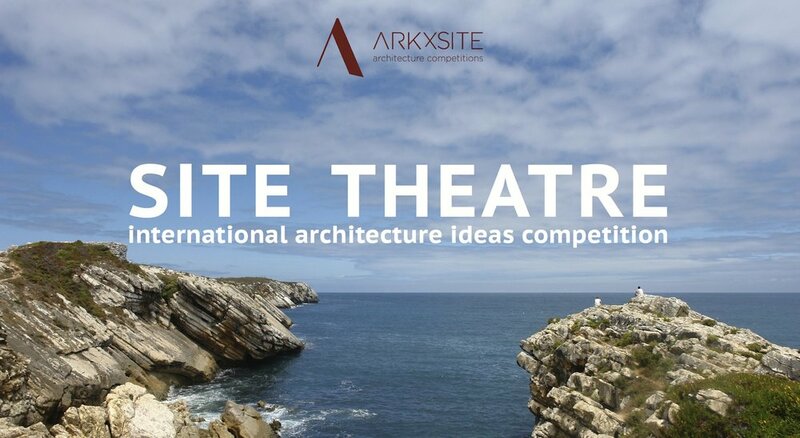 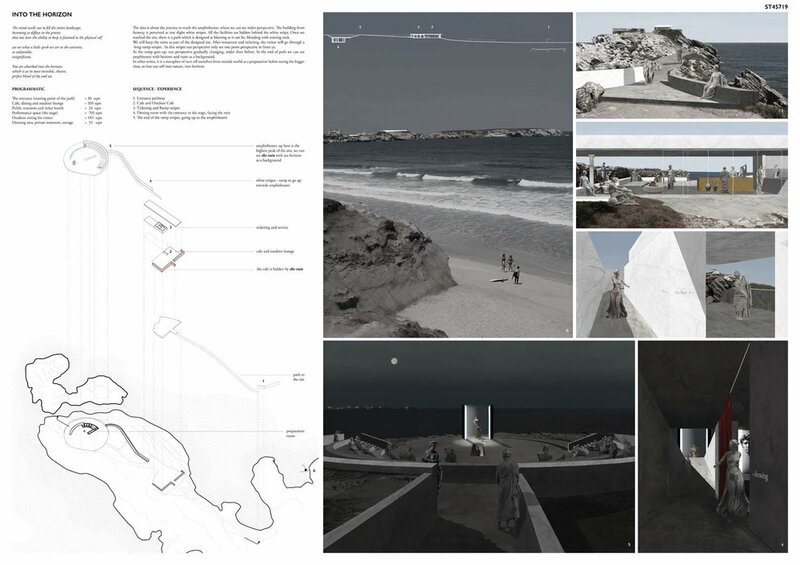 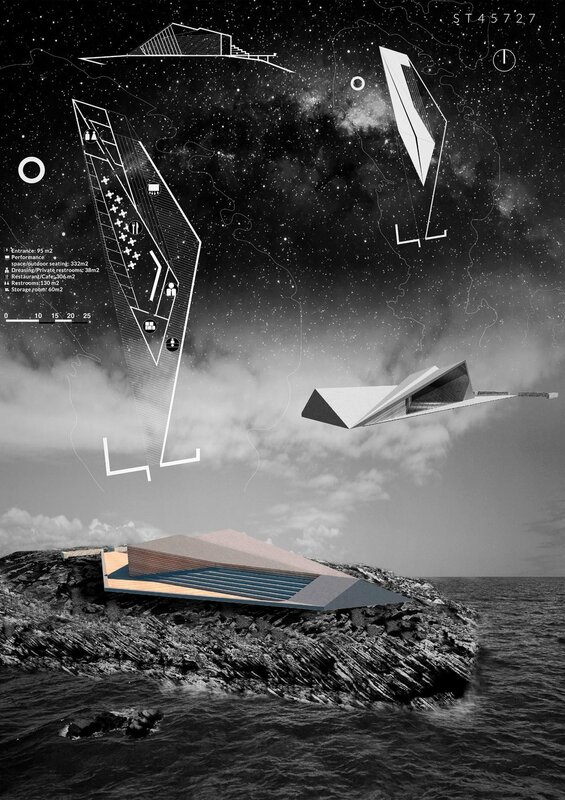 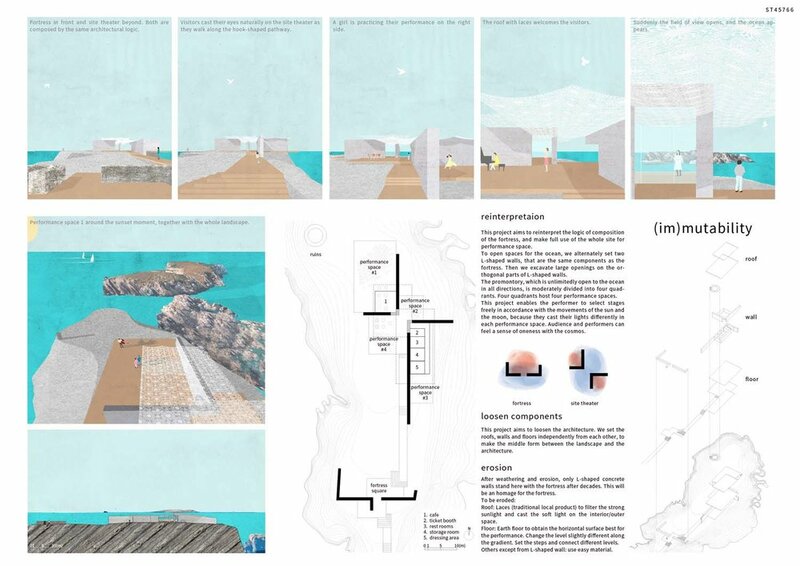 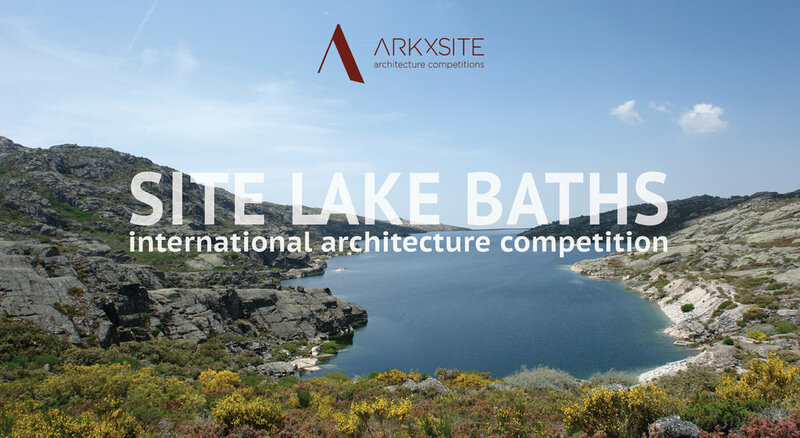 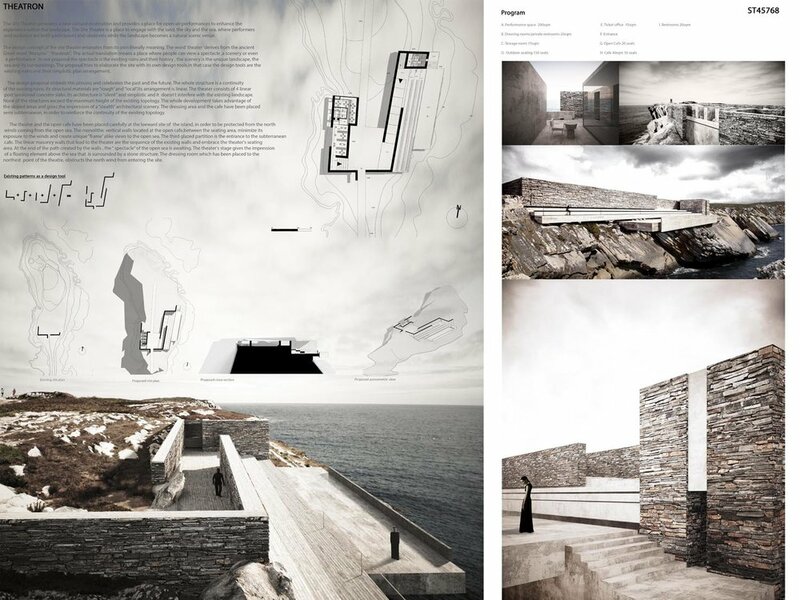 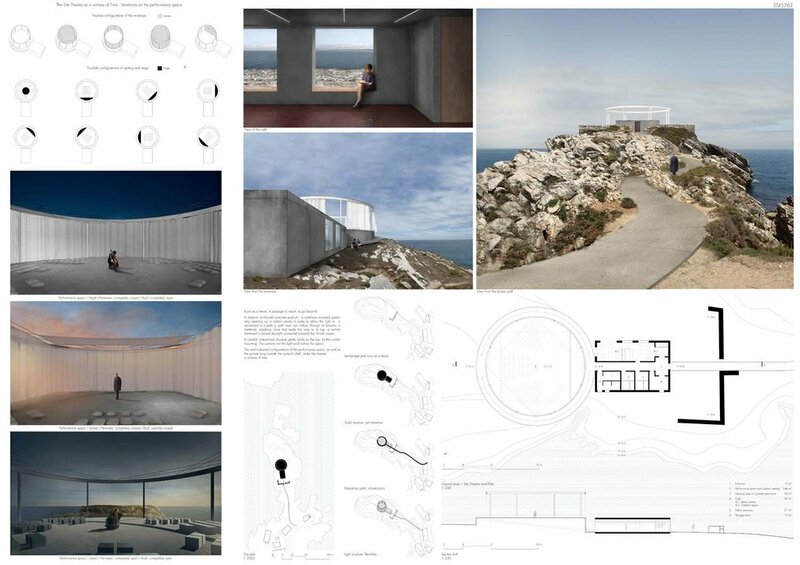 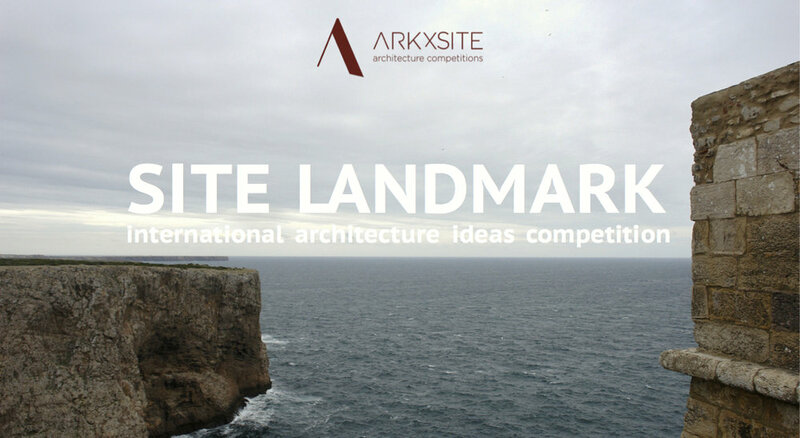 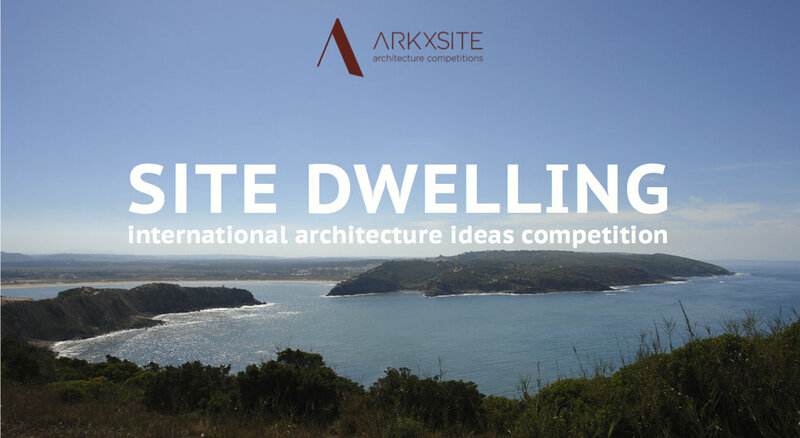 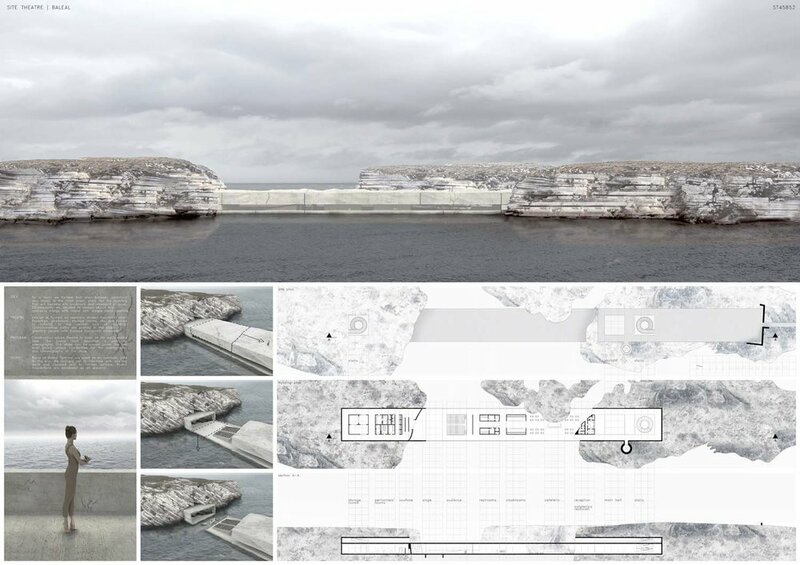 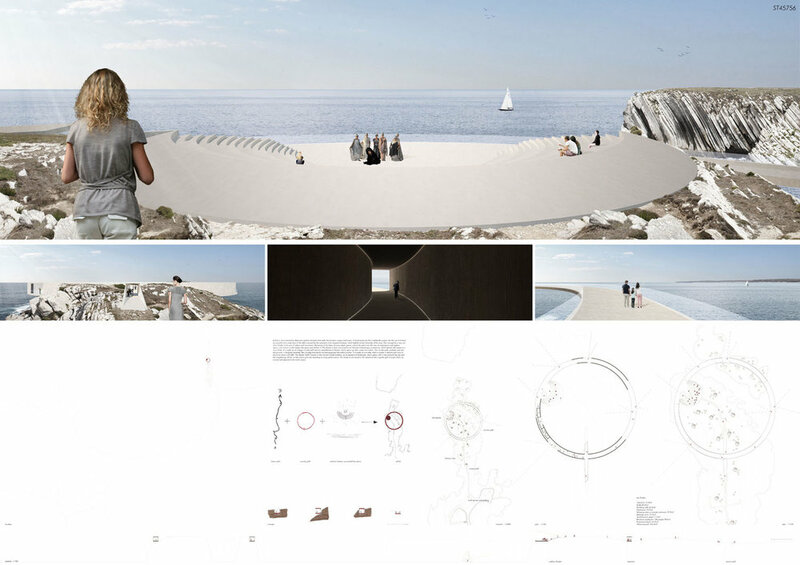 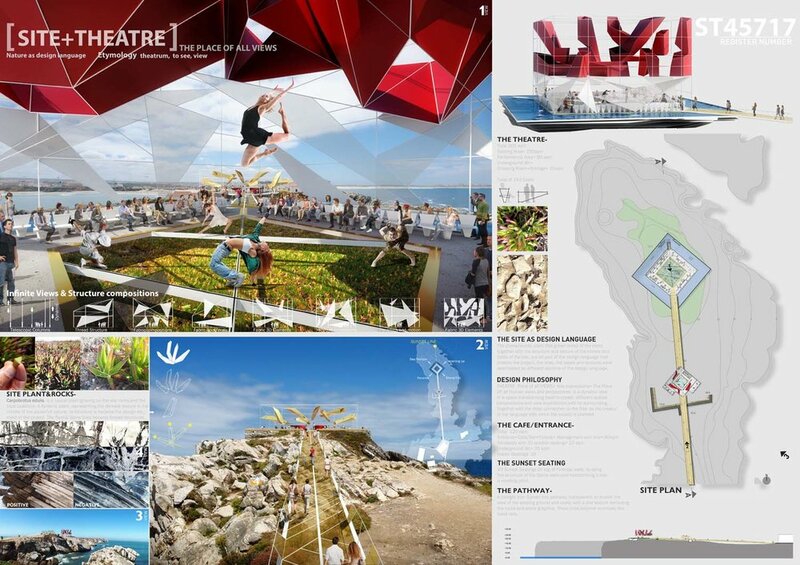 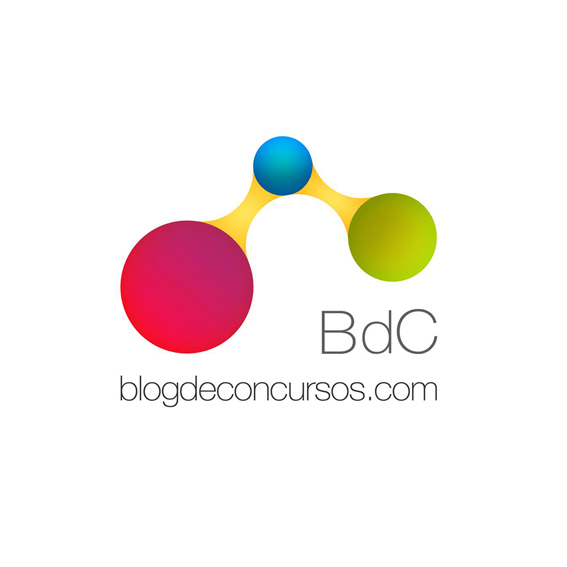 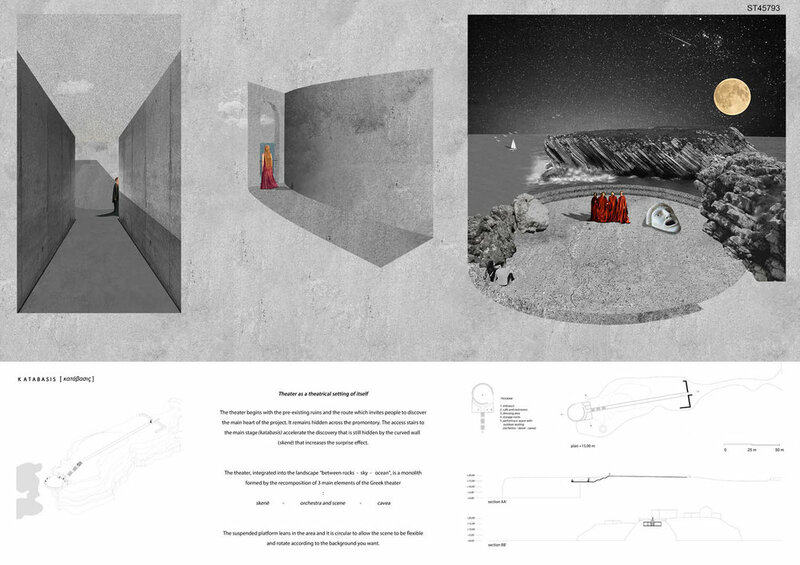 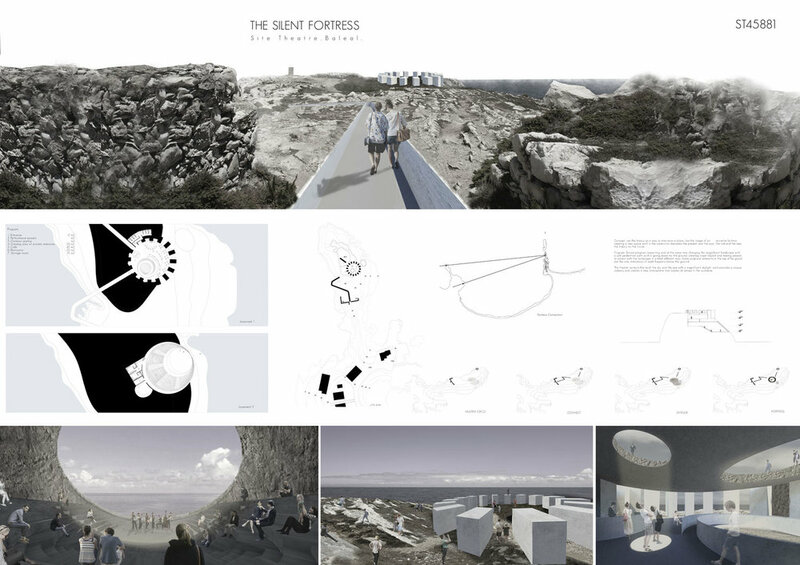 This international one-stage architecture ideas competition invites all architecture students, young architects and young professionals with a degree in architecture studies (≤ 40 years old) to develop and submit compelling ideas for the design of a Site Theatre located on a site promontory near the Fortress of Baleal, in Baleal, Peniche, Portugal. 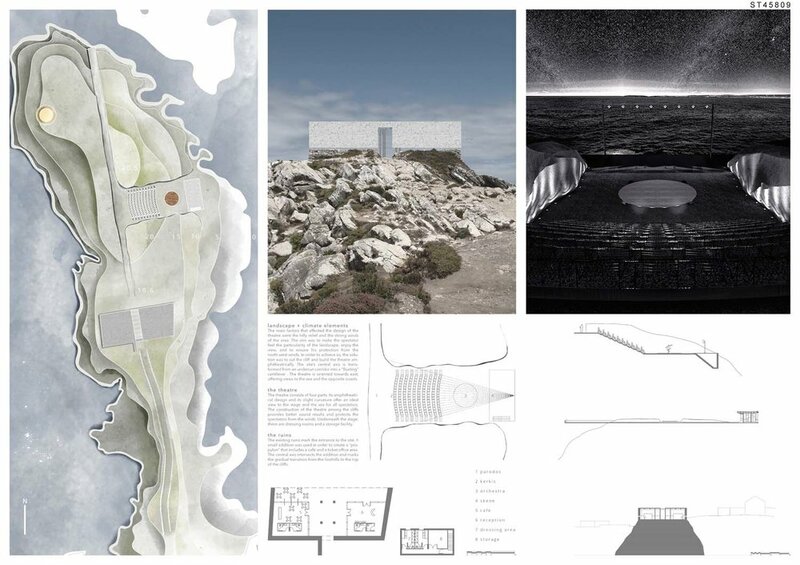 The Baleal Fortress is a significant landmark located within a remarkable place; a powerful natural scenery where the remains of the Fortress rises from the landscape and together with the cliff surfaces eroded by the wind are notable features within this setting. 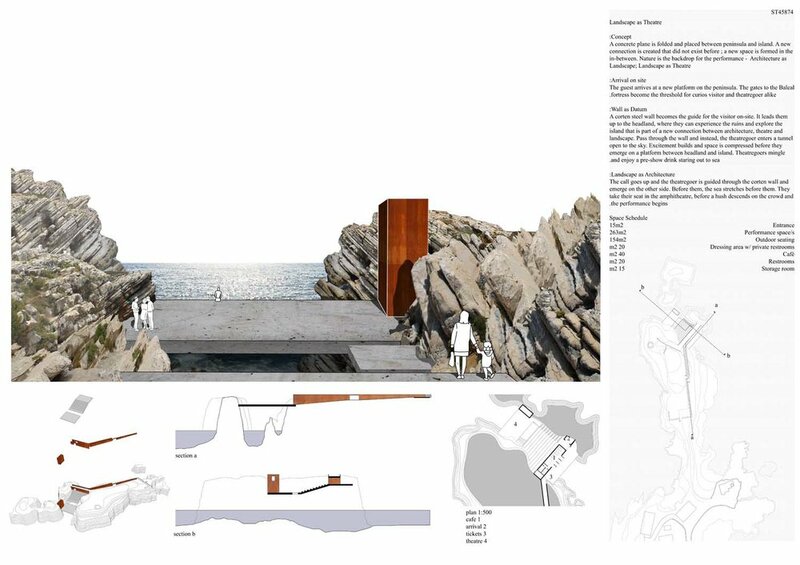 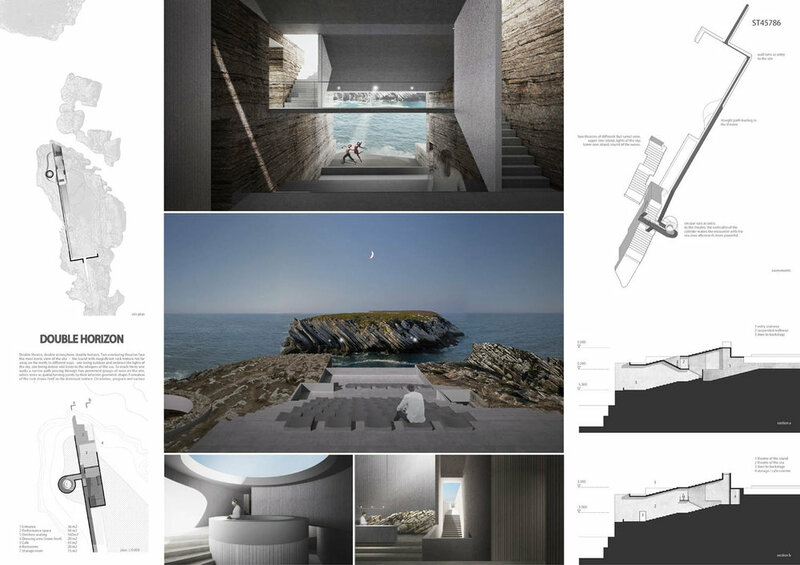 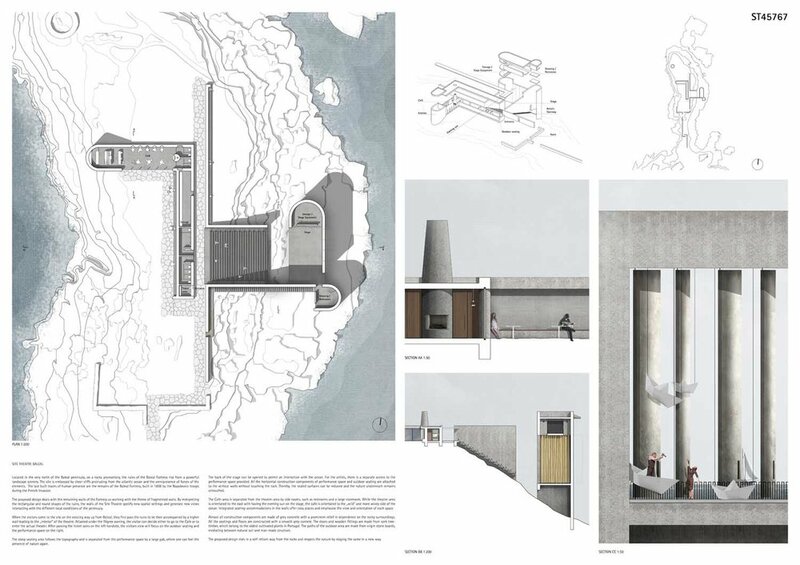 When generating a vision for an intervention located within such a spectacular place, it is essential that each design proposal emphasises, respects and celebrates the site and existing ruins, while providing visitors with a unique experience. 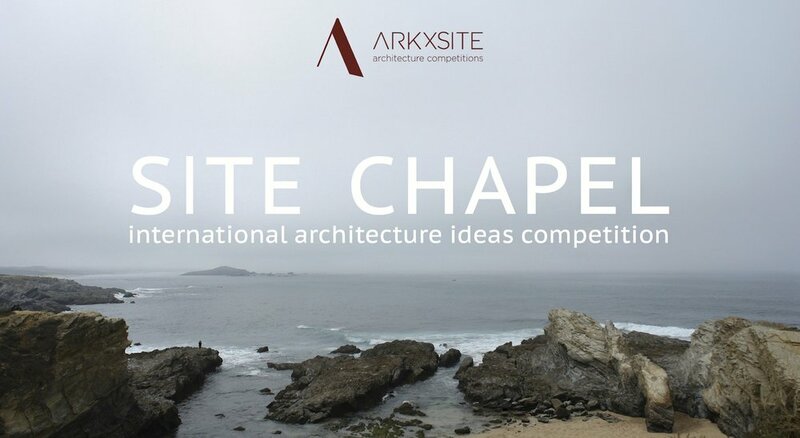 This is strictly an ideas competition, an academic exercise and will not be built. 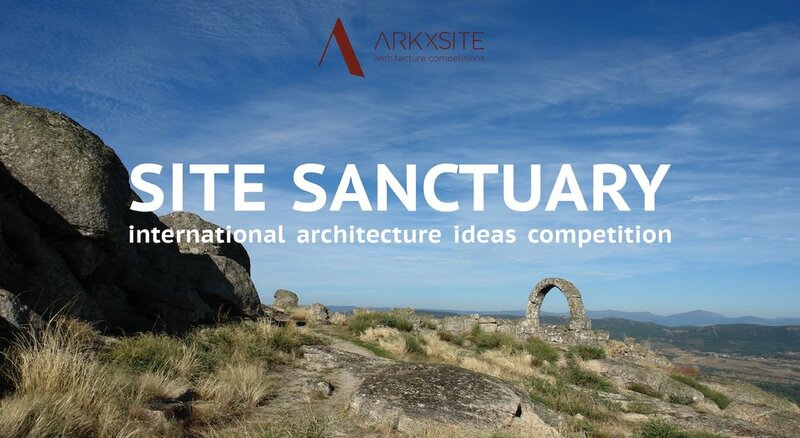 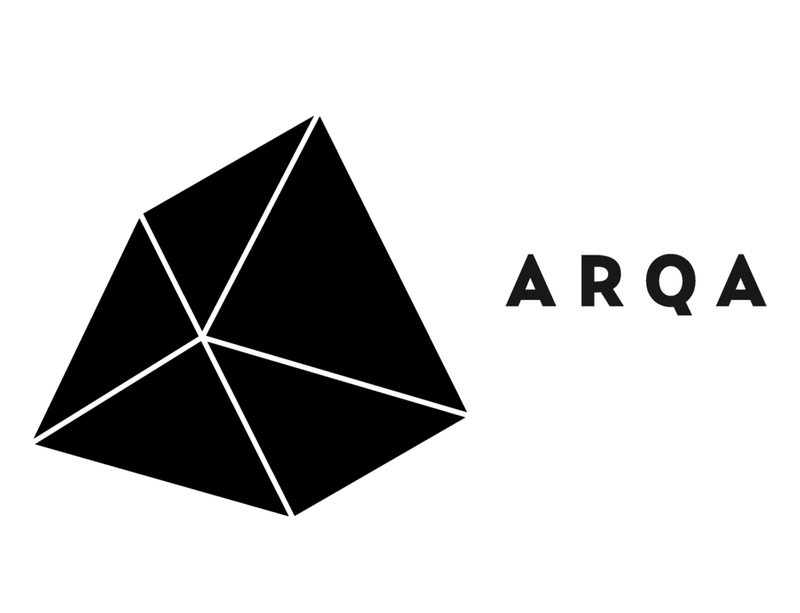 ArkxSite nor any other organisations do not have the authority nor intention to award contracts for design services as a result of this competition. 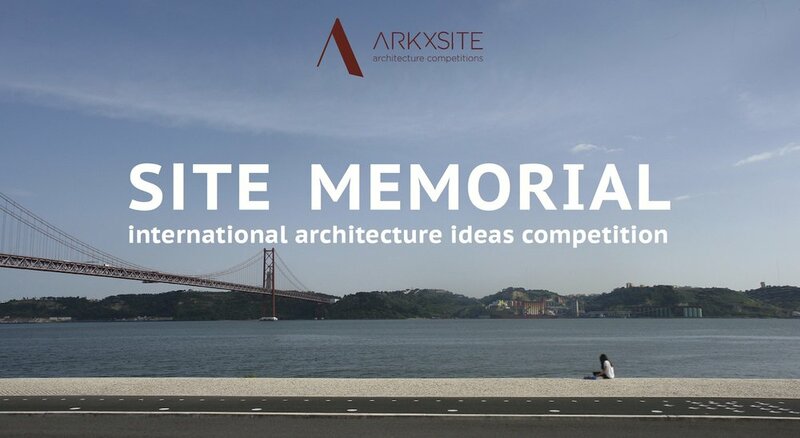 Awarded proposals should consider their award as recognition of excellent work in this competition.